The Pacific Meridian (Tikhookeanskiy Meridian) rapid tournament was held on 18-20th July at the student campus of DVFU in Vladivostok, Russia. The event was 11-round swiss with the time control 15′+10”. The results are valid for the Rapid Grand Prix Cup of Russia. Grandmaster Vladimir Onischuk started furiously with eight straight wins before routinely drawing the last three games to maintain a clear first place with 9,5/11 points. Onischuk earned 2400 EUR from the total prize fund of 10,600 EUR. Grandmasters Sergey Volkov and Dmitry Bocharov shared the second place a full point behind the winner. Standings below. The chess festivities in Vladivostok continue with the “Seaside Opening”, a 9-round swiss open, on 21-29th July. The tournament is a stage of the Cup of Russia in classical chess. The “Russkiy Island”, the stage of the Cup of Russia among boys and girls, will be held concurrently with the adults’ event. The Russky Bridge connects the mainland part of the city with Russky Island. 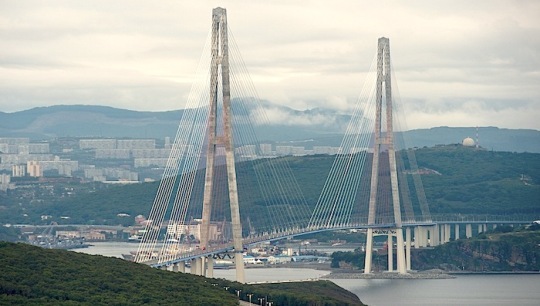 The bridge was completed in July 2012 and opened by Russian Prime Minister Dmitry Medvedev.